Colorful masks! Rippling muscles! Fiendish monsters! Deadly takedowns! Psychotronic plot twists! Welcome to Lucha Libre Hero, the game of heroic masked Mexican wrestlers dedicated to combating evil in the ring and on the streets of Mexico City. 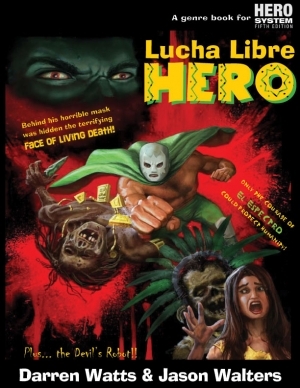 Inspired by the extensive film legacy of such popular figures as El Santo, Blue Demon, and Mil Mascaras, Lucha Libre Hero pits heroic Luchadores against the supernatural monsters, mad scientists, and menacing mobsters that populate the world of classic Mexican cinema - not to mention the ever-present menace of their malevolent wrestling enemies! *A sourcebook including sample heroic Luchadores, evil Rudos, monsters, mobsters, mad scientists, and an extraordinary vision of Mexico City extrapolated backwards from hundreds of hours of film viewing! Get ready to drop the Elbow of Mexico on evildoers with Lucha Libre Hero! Your books have such beautiful color covers and when you download the PDFs, they have no cover and are completely in grayscale. Is there any way to get the full color cover? My decision to purchase this was half based on that awesome cover. This title was added to our catalog on May 09, 2009.